On Saturday March 9th David Gayton gave a stirring presentation on the history of Open Air Preaching, tracing the personalities and the preachers who, through the centuries have faithfully proclaimed the Gospel of Christ in times of persecution and times of revival. The recording of this talk is available here. Our dear brother Paul Lewis was called home to be with his Lord and Saviour on February 1st 2019. Paul had been the Pastor at Welcome Hall Evangelical Church in Catshill for 37 years, retiring in 2010. His funeral service was held on February 15th at Welcome Hall and a recording of the service is available here. A special meeting for the young people was held on February 2nd with a guest speaker, Professor Steve Taylor from Liverpool University, speaking about Christianity and Science, providing solid arguments for the reasonable basis of the Christian message and highlighting the inability of science to provide answers to the real questions of life. An article on this subject, co-authored by Steve Taylor can be found on the Answers in Genesis website: here. We are pleased to announce the re-launch of a Young People's Meeting after a number of years without a meeting for young people. 'Pathfinders' is for young people from the age of 12 years and they are meeting on the first Saturday of each month for a time of games, fellowship and a Bible talk. We enjoyed a church trip to Tewkesbury on Saturday 1st September which included a visit to the Old Baptist Chapel and a talk by the museum curator on the history of the Chapel and the Particular Baptists of Tewkesbury which dates back to the 17th Century. 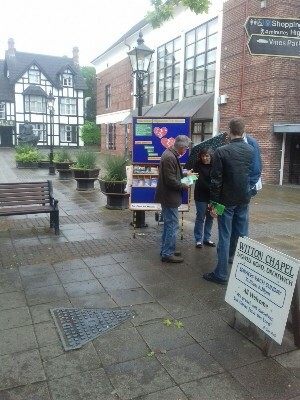 We have now extended our monthly literature table outreach in Droitwich to include an Open Air preaching occasion in the town centre. The thanksgiving and remembrance service for the life of Bernard was held at Witton Chapel on July 24th at 12:00pm. At the start of the service, mention was made of numbers of friends unable to attend and greetings were read from those who had sent condolences and fond memories of Bernard. A recording of the service is available here: "Bernard Blendell's Thanksgiving Service". At the same time that this service was held, Tomà held a remembrance service in the Children's School Room at Ikelenge. The room was filled with people as they also sang hymns, had a time of grieving and a message from Corinthians. Sadly our dear brother Bernard has also passed away only a month after his wife Joyce and we send our sincere condolences to all Bernard's family and loved ones at this time. He will be greatly missed by his family and friends and the children in Zambia that he and Joyce had cared for over the last 10 years but we do give thanks for his testimony that he knew his eternal home was in Heaven with his Saviour the Lord Jesus Christ. The funeral and remembrance service will take place at Witton Chapel on July 24th at 12:00 followed by the interment at Kidderminster. It is with great sadness that we report that Joyce has passed away at Kalene Hospital after battling for some time with TB and meningitis and we pray that Bernard, and her family and loved ones will know the Lord's comfort at this time and be assured that she has been taken home to be with her Saviour. Bernard himself is unwell and remains in the UK undergoing investigations. Sadly it has been necessary for Bernard to close down the orphan village work that he and Joyce had established and arrangements have been made for the children to return their home villages. We have started a fund for the support of the Orphan Village in Ikelenge to help meet the running costs (feeding and clothing the children and supporting the house mothers and other workers). Any gifts received for this fund will be forwarded in their entirety. PS This fund has now been closed as the work has closed down. We rejoice that we have a baptismal service planned for Easter Sunday evening (April 1st) at which a public profession of faith in Christ is declared through baptism by immersion in obedience to Christ's command.